Toys ‘R’ Us has announced they will be removing Breaking Bad action figures from their website and stores following a petition that was launched by a disapproving mother from Florida last week. 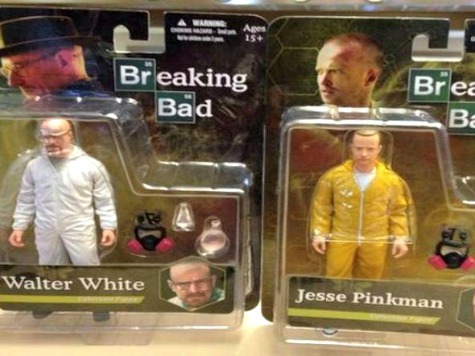 The collectible items are based on characters from the AMC crime drama Breaking Bad about Walter White, a struggling high school chemistry teacher with terminal lung cancer who produces and sells methamphetamine to ensure the financial success of his family before he dies. Toys ‘R’ Us told the Associated Press that the dolls were limited to certain areas of the store appropriate for adults, but that they were being removed immediately. “Let’s just say, the action figures have taken an indefinite sabbatical,” the retailer wrote in a statement. Susan Schrivjer from Fort Meyers, Florida, initiated the online petition last week on change.org, where she wrote that the dolls were a “dangerous deviation from their family friendly values.” The petition had 9,000 signatures as of Wednesday morning. “While the show may be compelling viewing for adults, its violent content and celebration of the drug trade make this collection unsuitable to be sold alongside Barbie dolls and Disney characters,” Schrivjer continued. On Monday, star of Breaking Bad Bryan Cranston fired back at the controversy on Twitter. Another online petition has since been launched by Daniel Pickett of Manhattan Beach, California, who is fighting to keep the Breaking Bad dolls on Toys ‘R’ Us shelves. Pickett’s petition has reached 4,000 signatures. “It is NOT irresponsible to have these in the store. It is only irresponsible if they sell them to people they are not appropriate for. That’s why I’m calling on Toys R Us to KEEP selling the Breaking Bad action figure collection in their stores and on their website as well as other “mature” toy lines,” wrote Pickett.